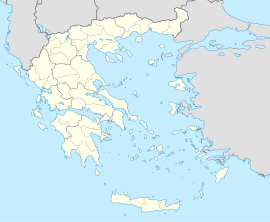 Megalopoli (Greek: Μεγαλόπολη) is a town in the southwestern part of the regional unit of Arcadia, southern Greece. It is located in the same site as ancient Megalopolis (Μεγαλόπολις). When it was founded in 371 BC, it was the first large urbanization in rustic Arcadia. Its theater had a capacity of 20,000 visitors, making it one of the largest ancient Greek theaters. Megalopoli has several schools, shops, churches, hotels and other services. The population of Megalopoli in 2011 was 5,779 for the town proper. A silver triobol of the Arcadian League from ancient Megalopolis. The head of Zeus on the obverse, Pan seated on the reverse. Megalopoli is situated in a wide valley, surrounded by mountains: the Taygetus to the south, the Mainalo to the north, the Tsemperou to the southeast and the Lykaion to the west. Its elevation is 430 m above sea level. The river Alfeios flows through this valley, coming from the east and flowing to the north, passing south and west of the town. Its tributary Elissonas passes north of the town. 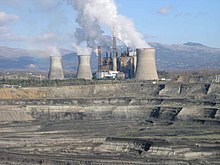 The large lignite deposits around Megalopoli are being exploited by open-pit mining. The Megalopoli Power Plant, 3 km northwest of the town centre, has produced electricity from this lignite since 1969. The A7 motorway connects Megalopoli with Kalamata and Tripoli, replacing the Greek National Road 7. The Greek National Road 7 connects Megalopoli with Pyrgos via Karytaina and Andritsaina. The railway from Corinth to Kalamata passes 4 km south of the town. Megalopoli is 24 km southwest of Tripoli, 41 km north of Kalamata, 45 km northwest of Sparti and 68 km southeast of Pyrgos. Megalopolis is known for its ancient ruins situated northwest of the town centre, on both banks of the river Elisson. The ruins include an ancient theatre that used to hold up to 20,000 people and was 30 m (98 ft) tall. Other landmarks include the Thersileon with 67 pillars and a temple (11.5 m × 5 m or 38 ft × 16 ft). Herodotus reported the ancient belief that the Megalopolis area was a battleground of the Titanomachy. The foundation for this apparently was the presence of lignite deposits, which are prone to catch fire in summer and can smoulder and scorch the earth for weeks (Zeus is supposed to have slain the Titans with lightning bolts; see also below), coupled with the presence of fossil bones of prehistoric elephants and rhinoceroses. Herodotus informs his readers that the bones of "Titans" were exhibited in various places in the surrounding area at least since the 5th century BC. The city was founded through a synodical of twenty to forty neighbouring communities between 371 and 368 BC by the Arcadian League in an attempt to form a political counterweight to Sparta. Megalopolis was a member of the Arcadian League after its foundation until the dissolution of the federation in 362 BC. In 331 BC, Megalopolis was invaded by the Spartans and there was a battle with the Macedonians that came to Megalopolis' help. In the 270s BC, Aristodamos the Good, managed to take control over the city as a tyrant backed by Macedon. In 235 BC, the second tyrant of the city, Lydiades, gave up control over the polis and the city became a member of the Achaean League. In 222 BC, the Spartan king Cleomenes III burnt down the city but it was rebuilt in the years after the destruction. As a member of the Achaean League, Megalopolis had a profound influence on the federal politics and it was the hometown of several notable Achaean statesmen and figures such as Philopoemen, Lykortas and Polybius himself. The city remained populated under the Romans but by the 6th century it was almost completely abandoned. The nearby village of Sinano (Σινάνο), situated south of the ancient city, was renamed Megalopoli after Greek Independence. The municipality has an area of 722.629 km2, the municipal unit 331.498 km2. The province of Megalopoli (Greek: Επαρχία Μεγαλόπολης) was one of the provinces of the Messenia Prefecture. Its territory corresponded with that of the current municipality Megalopoli, except the municipal unit Gortyna. It was abolished in 2006. ^ Lorenzi, Rossella (March 31, 2011). "Prehistoric Fossil May Have Inspired Greek Myths". discovery.com. Retrieved April 1, 2011.